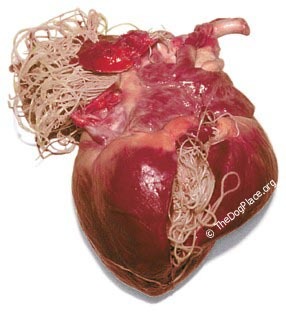 First-hand account of heartworm prevention medication failure, horrific PHOTO of heartworm infested heart shows what not doing veterinary rechecks can do to your dog..
People need to know how this can happen! How many owners blamed themselves when their dogs got a heartworm-positive reading and was on preventative, thought maybe they missed a dose and did NOT file a claim? I’m sure Merial doesn’t even get notified of 99% of the cases where dogs are on the heartworm prevention and still get heartworm. Changes to the advertising and insert label MUST be implemented!! This is a life threatening preventive, not flea control! My dog went in for her yearly check up and shots in April 2005. After 2 negative years for heartworm and giving her the heartworm preventative EVERY month I got a call that my dog was POSITIVE. I was shocked to hear this. She is 99% of the time an inside dog for one, second she is well cared for and I NEVER missed a dose of her Heartgard as it is posted on my calendar. I have purchased the heartworm prevention from my vet all year. My vet told me they had recently been to a seminar and found out that if the chewable is NOT chewed it does NOT dissolve and get absorbed into the dogs system, thus it does not prevent heartworm. I called Merial, got a case number and they covered my dog's heartworm treatment. HOWEVER they will not refund for the year I purchased their Heartgard product that failed, $96.00 dollars worth – they offered a year's heartworm prevention free, like I want to use that when it failed!! I spent 8 weeks having to keep my dog calm and quiet during treatment meaning I had to close all my blinds so she wouldn’t run to them barking, I had to take her to the bathroom on leash in a fenced yard so she wouldn’t run and chase squirrels, going out in rain storms and all. That was so the heartworms dying from the treatment didn't block her heart valves. I had to watch the horrible reaction to her shots as she suffered from heartworm treatment. Am I satisfied treatment was paid for and labeling, advertising remains the same, NO! I demand something be done about this so other owners do not experience the same. AND I WANT MY MONEY BACK!! Satisfaction guaranteed? Not for me it’s not. I was told on the phone by Merial, makers of Heartgard, that my case is handled between their vet and my vet. They don’t deal with me….last I knew I WAS THE OWNER OF THIS DOG. I plan on notifying the FDA who approves this so-called heartworm prevention drug, and animal welfare institutes, andbetter business bureau until something is done about it. Although my dog is now negative, she still could have irreversible heart damage from the worms that are unknown now. Below are details and the heartworm prevention advertising/ label information as it is written today with my comments. The chewable should be administered in a manner that encourages the dog to chew (WOULD SOMEONE TELL ME HOW TO “ENCOURAGE A DOG TO CHEW”? NEVER TAUGHT A DOG THAT ONE! ), rather than to swallow without chewing. Chewables may be broken into pieces and fed to dogs that normally swallow treats whole. Care should be taken that the dog consumes the complete dose, and treated animals should be observed for a few minutes after administration to ensure that part of the dose is not lost or rejected. If it is suspected that any of the dose has been lost, redosing is recommended. THEY FAIL TO WARN YOU WHAT HAPPENS IF THE TABLET IS NOT CHEWED – IT DOESN’T DISSOLVE SO IT’S NOT ABSORBED INTO THE SYSTEM!!! NO WHERE ON THE ENTIRE INSERTED LABEL DID I SEE ANY MENTION OF THIS AS A WARNING. #1 Choice of Veterinarians for Heartworm Disease Prevention Not true, not my vets #1 choice and another vet in town doesn’t even sell it. False advertising! HEARTGARD Chewables are labeled for the prevention of heartworm disease. Heartworm disease is 100% preventable (totally not true and my dog is proof of that) with HEARTGARD Chewables, satisfaction guaranteed! 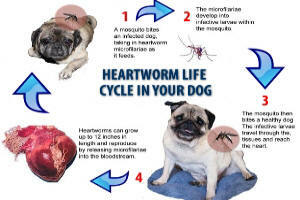 All you have to do to protect your dog from the threat of heartworm disease is to give HEARTGARD Chewables once a month and use as otherwise directed. Protecting Pets. Protecting People – Now there is a crock if I ever read one!! 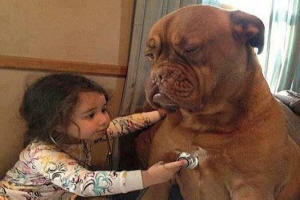 "You want the best for your pet. HEARTGARD brand products help you provide the best protection (oh really ??) for your pet against internal worms that may pose a serious threat to its health." My vet is Deland Animal Hospital - Hwy 92 in Deland Florida - I do not care for them to get in the middle of this they have been wonderful through it all and there are ethics involved – but if you need documented information they have it. NOW PLAYING IN VIDEO THEATER, these articles inspired a video production by Health Ranger. Prescribing Death (6 minute video) reveals the sick truth of many prescriptions and the equally horrid effects of over-vaccination in humans and animals. Dr. Lee reports horrible results from Revolution on her dog. Recall, FDA rulings, buy-outs, label changes, risks vs. benefit. 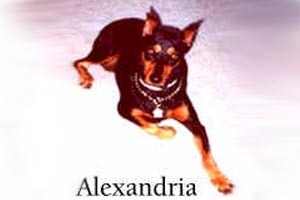 FDA reveals Trifexis kill rate rivals heartworm deaths!